Any body in the Reims area on the 10th July will be able to get a glimpse of the “Tour de France ” that is arriving in Reims that evening. This year’s tour is of particular interest to people in the UK as it starts its 21 day journey in Leeds, going through York, Cambridge and London before hitting the shores of France. The sixth stage will be run from Arras in the Pas de Calais and arrive in the famous Champagne city of Reims. 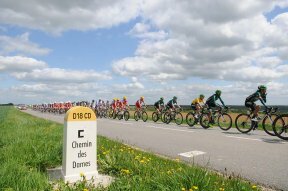 The 194km stage will ride through the first world war battle field of the Aisne department, crossing in particular the ‘Chemin de Dames’. As a homage to the Great War which celebrates its 100th anniversary this year the route has been chosen to pay its respects to those who fell in battle. the route passes within four miles or so of the Croix Blanche lakes as it heads across the “Chemin des Dames” after leaving Pinon, before going through Craonelle & Pontavert on its way to the finish in Reims.